New York sequences directed by David Kennard. Gene & Brain Library sequences directed by Richard J. Wells. Whales sequence directed by Richard J. Wells and David Kennard. Here is another one of the half-hidden gems of "Cosmos". Its primary focus on information storage seems like a dry and unglamorous subject at first, and yet this episode succeeds better at tackling the question of interspecies communication than the next episode which tried to address the subject more directly. But if we can't crack the communications barrier with whales and dolphins, which evolved here with us on our planet, what hope have we of communicating with beings who evolved elsewhere in our universe? What does our interaction with whales say about us and our attitudes towards species who may be very, VERY different from us? Very few astronomy documentary series give much time or thought towards the question of the keen minds of our underwater brethren, so I have to give "Cosmos" a lot of positive points for exploring the idea and its details with such a rich and audio-visually rewarding sequence as we get early on in this episode. Perhaps Sagan's frequent return to the idea of the digital bit is worth noting also. This was a fairly new concept at the time, suddenly put to use to bring us photos from probes exploring the outer planets, and sending large swaths of information all around our own planet via satellite and fibre optic cables. It was the new standard unit of computing, which offered so much fresh opportunity in science, business, and the arts. But should all information in the universe be seen as conglomerations of polarized, black-and-white choices? With many non-digital, or analogue, devices making celebrated comebacks these days, it could be argued that there are such aspects of information that don't easily fit into digitized representations while still retaining their unique essence. Food for thought. 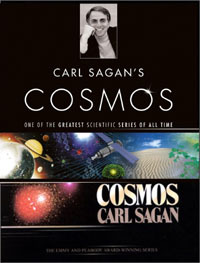 At any rate, "Cosmos" here utilizes its digital bit metaphor for a very useful purpose: as a unit of measure which enables us to contrast increasing levels of intelligence of various living beings, and by extension entire civilizations in concert. The scale of this contrast is huge and awe-inspiring. We have the digital bit to thank for making this clear intellectually, while visual effects, sets and props, music, and Sagan's own story-telling ability drive the point home emotionally and unforgettably. The sequences concerning brain structure and function and evolution are fascinating, even if the information seems superfluous to anything any of us might want to do. It's neat, but somehow feels surplus to requirements. Perhaps it is what is missing that makes this section feel a bit malnutritious - Sagan's philosophy is that of the materialist, and that all intelligence is a product of the physical brain. Too bad there's no mention of the intelligent mind that might merely be using the brain with all its stored DNA and learned information. Still, there is a lot of good stuff here, not least of which is the highlight with which Sagan ends this section: that we can each take self-responsibility for what we learn and how we choose to act and grow and live. A supreme moment. I do really like and appreciate the shift that occurs next, as we leave behind the intelligence of individuals and examine instead the collective intelligence of an entire society. Even the building and evolution of cities can be seen as an expression of this phenomenon, as amply demonstrated by the abundant time-lapse photography in this section, as well as Sagan's recounting of the history of New York city. But it is in our invention of writing and books and libraries that the greatest repositories of learned Human knowledge now reside, and Sagan spends most of the rest of the episode appreciating and glorifying this aspect of our culture. Before it's all over, we have advanced to the digital age of computers - and modern versions of "Cosmos" introduce a welcome cheat by showing information on computer screens that are more advanced than those of 1980, or even the usual 1990-1992 Cosmos Updates. One screen boasts info of the 1994 reports of the Shoemaker-Levy 9 comet fragments. Cool. (Anything written in green text represents a name I made up to help keep some music better identified in my own head. Wm. Jeffery Boydstun In Motion Delta 01 -> 02 (25:01 - 28:09) ???? Read the data capsule review for the next episode: "Encyclopaedia Galactica"